"Our Saint Jean Baptiste Chapter returned to Mary Manning Walsh to visit the ladies on the 6th and 8th floor again. When we arrived, the ladies were excited to see us again. 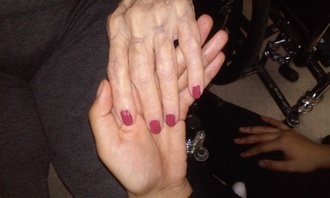 Judy, who I had painted her nails before, smiled and asked to change her nail polish. Reiko sat next to Judy, admiring her new nail color called 'Espresso' by Sally Hansen. However, Reiko refused to change her nails because she still loved hers red. Reiko laughed and said, "Maybe next time!". As Aliyah and I filed Judy's nails together, Reiko was giving us fashion tips. She explained that her nails must always match her clothes and jewelry. Reiko even admired our #GGMovement shirts. Judy joked that Reiko talks too much. When we finished Judy's nails, she kept smiling. We talked some more and chose a new color for next time Glamour Gals came. She said to "Save the Reds for Reiko! ".I could not believe how funny they were. Judy thanked us and said the Saint Jean Baptiste Chapter is a beautiful chapter. These two ladies made me laugh and smile so much. We talked liked friends because we are! I can not wait to see them again. Hopefully, we can get Reiko to change her red nails next time!"